Represented by Leo de Nodrest, Lilian Bardet and Jules Rolland; France the top seeds, duly reserved first place in their initial stage group in the Junior Boys’ Team event at the 2017 Hungarian Junior and Cadet Open in Szombathely on Friday 10th November. Likewise the combination formed by Belgium’s Florian Cnudde and Valentin Pieraert who joined forces with Norway’s Sondre Berner and occupied the second seeded position, emerged unscathed to top their group. However, lower down the list there were surprises with Maksim Grebnev being the player to attract the attention. 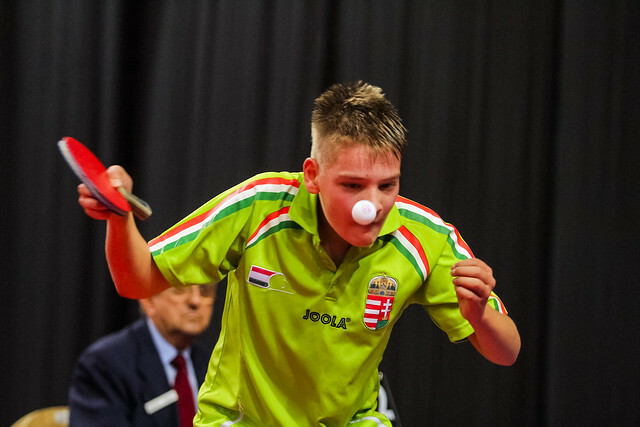 He beat both Rares Sipos (11-4, 11-9, 10-12, 11-7), the winner one day earlier of the Junior Boys’ Singles event and Florin Spelbus (11-7, 11-8, 11-8) as Russia recorded a three-two win against the fifth seeded Romanians to secure first place and progress to the main draw. Alas for the Romanians it was the end of the road, only the outfits finishing in first place in their respective groups advanced to the knock-out stage. Similarly, the seventh seeded Latin American combination comprising the Dominican Republic’s Mariano Lockward who teamed with Argentina’s Francisco Sanchi and Santiago Tolosa experienced defeat. They suffered a three-one reverse at the hands of Chinese Taipei’s Li Hsin-Yang, Kao Min-Chi and Lin Kung-Chung, prior to experiencing a three-nil defeat when facing Japan’s Aoto Asazu, Yutaka Kashiwa and Takeru Kashiwa. Li Hsin-Yang, Kao Min-Chi and Lin Kung-Chung duly topped the group; they beat Aoto Asazu, Yutaka Kashiwa and Takeru Kashiwa by three matches to one. No place in the main draw for the seventh seeds; it was the same for the eighth seeded Polish outfit formed by Artur Grela, Jan Zadecki and Kamil Dziadek. They finished in second place behind Portugal’s Vitor Amorin, Tiago Li and Goncalo Gomes. Meanwhile, in the Cadet Boys’ Team event matters have advanced to the semi-final stages. In the penultimate round Hungary’s Oliver Both and Csaba Andras meet the French pairing of Fabio Rakotoarimanana and Myshaal, Abhi; in the opposite half of the draw Italy’s Simone Sofia and Andrea Puppo oppose the partnership formed by Ireland’s Owen Cathcart and Norway’s Borgar Haug. The Junior Boys’ Team and Cadet Boys’ Team events conclude on Saturday 11th November.